I had a midwife appointment, ultrasound and perinatologist consult this week. All good reports! Even still, I cried...and I'm not really sure why. I was partly not impressed with the perinatologist I saw (bedside manner, people! ), and partly overcome with pregnancy hormones, I think. Overall I'm feeling great, although I am much more tired now that I'm in the third trimester. My contractions have definitely lessened, so hopefully that means my bladder infection is gone. I've finished my prescription and am hoping it doesn't happen again! We learned this week that I may have a non-stress test at one of my next two appointments. Also, because of my abnormal placenta, my midwives will likely not let me go past my due date (June 11). Which means there are officially only 10 weeks or less to go before we meet him! Eek! 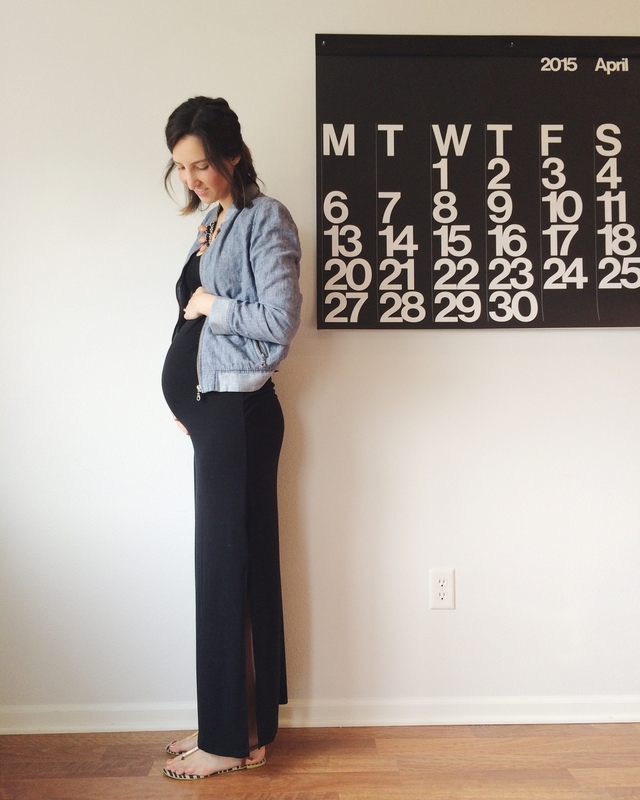 Maternity clothes: Maternity clothes are the most comfortable and most flattering on me right now. See my favorites here. Now that it's spring, I'm gravitating toward dresses that aren't too snug on my belly. Movement: I downloaded the Count the Kicks app, but have just been doing it in my head so far. He usually gets to 10 kicks in a few minutes. We can see my belly jump and move now too, which is fun. Have you ever heard of pregnant women losing their hand strength? It's so strange, but I can't open jars or bottles anymore! Apparently it is a thing...I had no idea! I feel like I am losing my mind most days. Annnd...I have a strong desire to chew on my toothbrush (which I do) and on the wet laundry (which I don't). I had these symptoms last pregnancy, too, and it's so strange. Does this count as pica? Or a deficiency of some sort? I will have to ask at my next appointment. Sleep: Sleep has been good. I get about eight hours a night. I can tell I am using dreams to process through stuff I'm anxious about, though. And sometimes I wake up and find that the arm I'm laying on is asleep. What I miss: Being able to hug Eric and carry Rooney comfortably. Nursery update: We have not made any progress on his room in the past two weeks, but we have made some progress in the basement (painting and choosing flooring), which will affect his nursery because once we have flooring down there, we can move our guest bed out of his nursery and get everything arranged in there! We have had seven ultrasounds so far this pregnancy, plus one more to come. It's just so crazy to think about since we only had two with Rooney. For some reason I have a feeling he's a Tuesday baby. June 2 or 9, maybe? I would have liked to have maternity photos taken this week, but we have them scheduled for 34 weeks instead. Hopefully I am not too swollen by then! My friend Heidi had her baby girl last week and it has given me the biggest baby fever!